“Transcending history and the world, a tale of souls and swords… eternally retold.” Truer words have never been spoken. 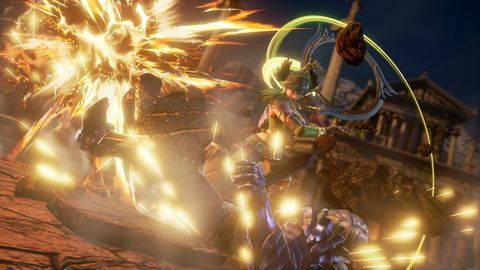 Over six years since the last installment, and a full 20 since the first game, Soul Calibur returns to its roots in its latest installment. 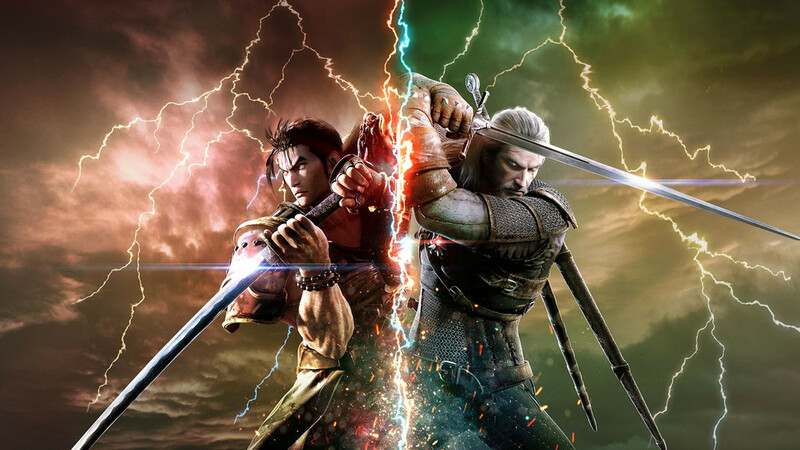 After its predecessor left fans lukewarm – and as a reboot – it falls to Soul Calibur VI to both reinvigorate the franchise for veteran fans while simultaneously opening the door for new ones. A good place to start would be the combat. The series’ iconic gameplay returns in full force with its weapon-based combat and 8-way run system. The roster of 21 characters (22 in the Deluxe Edition) is a bit meagre by today’s standards, but it is more than made up for by each fighter being a fan favourite – such as returning characters Zasalemel, Seong Mina and Talim, who were omitted from Soul Calibur V – and each having a unique and distinct playstyle, such as new guest character Geralt of Rivia from The Witcher series. 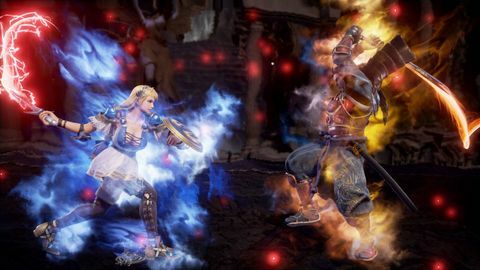 It falls to Soul Calibur VI to both reinvigorate the franchise for veterans while simultaneously opening the door for new ones. Each fighter has their standard vertical, horizontal and body strikes, and can move freely in any of the eight directions. The controls are tight and responsive and the animations smooth, allowing players to strategically maneuver themselves and pull of quick dodges and counterattacks with precision. This is something that has been present throughout the series and has simply been refined in the latest installment. The Soul Gauge makes a return and has been combined with the Soul Charge mechanic not seen since SC3. Players can still spend one bar of their gauge to unleash their Critical Edge, a unique and flashy ultimate attack, or they can spend it to activate Soul Charge. Unlike previous games where it would just buff your next attack, the new and improved Soul Charge puts you into a powered-up state for a set amount of time. While in this state, your strength and speed are increased while certain attacks and combos are upgraded with additional hits – similar to the meter burn Edge Attacks from SC5 – or outright replaced with more powerful attacks. But the biggest, most welcome change to the Soul Gauge is that it no longer costs meter to guard impact, a limitation that was introduced in SC5 that inexplicably punished defensive play. The last new mechanic is called Reversal Edge, and allows players to instigate a clash. During this, both players must input either an attack, guard or movement, with the outcome determined by each player’s input. On the surface, this may seem a simple paper-scissors- rock-style mechanic to give players a quick breather, but once you start getting deeper into it you will discover there is plenty of room for trickery and mind games – for example, initiating a Reverse Edge and successfully inputting a sidestep to dodge your opponent’s vertical attack, leaving them wide open to your Critical Edge. As is the case with most games right after launch, the online mode is still a bit unstable. In the twelve matches I have played at time of writing, the connection dropped within the first few seconds of five of them. But when it does work, it runs very smoothly with minimal frame drops at as low as one bar. The character creation system has taken a large step forward, along with several backward. You can still customise cast characters as well as create brand new ones, and you now even have 16 different races to choose from. However, while some are unique such as the lizardmen, the mechanical automatons and the skeletons, many are just the human models with a texture put over them, or with cosmetic items such as wings and horns put on by default. In addition, there are no unlockables for creation mode. Unlike SC5, in which you unlocked additional items by simply playing the game, what you see here is what you get (presumably, more will be added in DLC). This is not helped by restrictions placed on certain races, such as the automatons having only one set face and “skin” colour, or lizardmen only being allowed to wear about 20% of the items. Let me make my scalesona, goddammit! 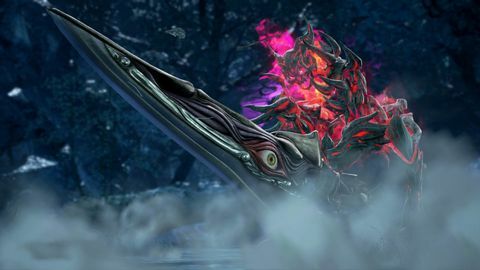 Storywise, the plot of Soul Calibur VI is told via two modes: Soul Chronicle and Libra of Soul. Both modes are vastly different from one another and tackle the story from different angles. 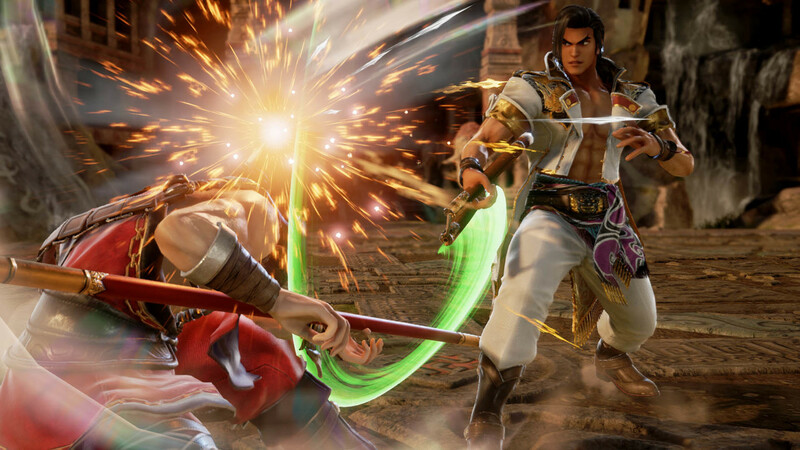 Soul Chronicle is the standard story mode in which you play as the main trio – Kilik, Maxi and Xianghua – in a retelling of their adventure from the first Soul Calibur, while the rest of the cast’s stories are available as supplementary campaigns. Between fights, the plot is conveyed through stills of the characters on beautiful, canvas painting-like backgrounds – a definite step up visually from SC5’s monochrome parchment sketches. And you will certainly have plenty of opportunities to see them as they are very dialogue-heavy, often taking up whole chapters; Zasalamel’s entire campaign is just six chapters of him narrating his backstory with zero gameplay. Libra of Soul, meanwhile, is the meatier of the two modes and is clearly the main attraction. 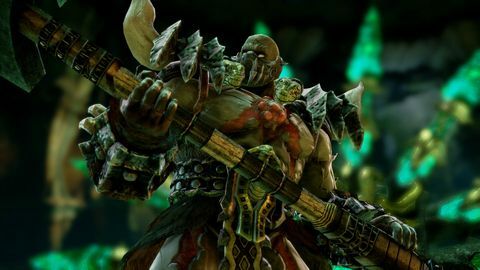 This mode is a spiritual successor to Weapon Master and Chronicles of the Sword from SC2 and 3 respectively, as it has the player take control of their own custom character in a fighting game-RPG hybrid. The plot is told via text that, unlike Soul Chronicle, is not accompanied by a voice-over. This, along with the rather slow start, makes Libra of Soul quite dull at times. This mode does offer player choices through dialogue options, ranging from something as minor as how you choose to interact with a character to as major as an action that can change your alignment between good and evil. However, these are Telltale choices in that they only really affect certain pieces of dialogue and the ending. This mode does manage to spice things up when it comes to the actual combat, though, by adding special conditions to each fight such as only high, mid or low attacks being effective or by making the arena floor slippery, forcing you to adapt your playstyle and effectively learn the ins and outs of your chosen fighting style. 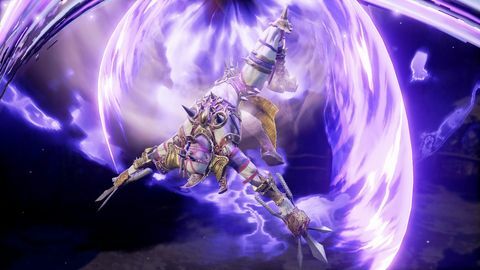 Soul Calibur VI’s visuals are absolutely gorgeous. Aside from the aforementioned background art in Soul Chronicle, each stage is also vibrant, beautifully lit, and dynamically changes between rounds – something that is hopefully becoming standard in fighting games. Unfortunately, the game does have some long and frequent loading times taking anywhere between 10 and 30 seconds. The tradeoff, however, is that the game runs smoothly at 1080p and 60fps. Over in the sound department, the series’ iconic soundtrack makes a return with its grand, sweeping orchestral scores, and like Ezio Auditore before him, Geralt even brought one of The Witcher 3’s tracks – “Hunt or Be Hunted” – along with him. The voice-acting is, in typical fighting game fashion, hammy and over-the-top. Though, for some reason, the Japanese voice tracks for pre and post-fight dialogue are rather quiet, barely audible over the music. 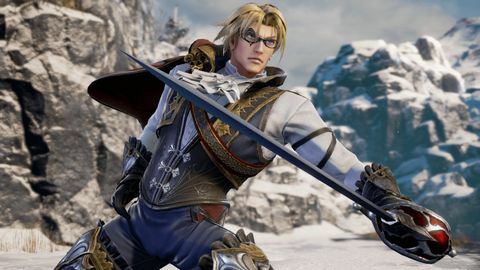 In spite of some odd missteps, Soul Calibur VI is overall an improvement over its predecessor. 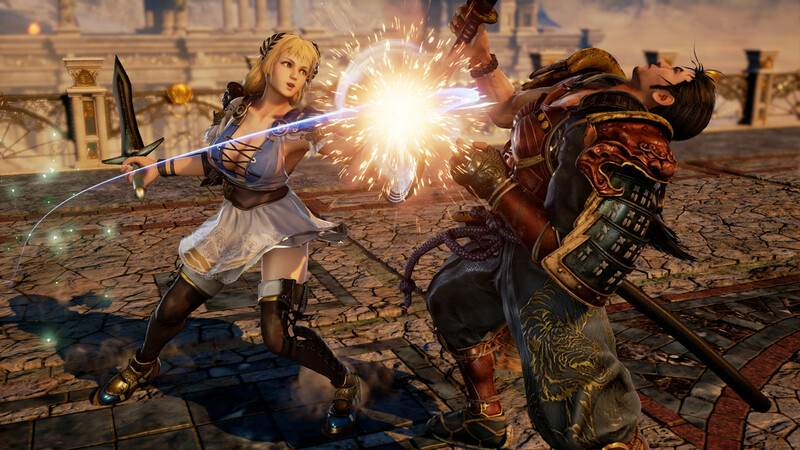 Its new and updated mechanics bring a breath of fresh air to the Soul Calibur formula to keep veterans interested, and as a reboot is an ideal starting point for newcomers. To quote the announcer from SC3, Soul Calibur VI is “seriously wounded, but the soul still burns”. Ups Refined and updated combat, new mechanics add a new dimension to fights. Defensive play no longer punished. Story mode encourages experimentation with fighting styles. Gorgeous visuals and smooth framerate. Stellar soundtrack Fun, over-the-top voice acting.